The EinScan-S 3D scanner is a new affordable consumer oriented desktop 3D scanner from the Chinese company Shining 3D that is supposed to offer high-quality results at a sub $1000 USD price – it should be available for $899 USD. This 3D scanner uses structured light phase shifting technology and should be able to provide accuracy of ≤0.1mm, a resolution that should provide one of the best detail levels for a non-professional, consumer oriented and affordable device. The EinScan-S 3D scanner apparently has two modes, one using the provided automatic turntable for scanning smaller objects with a size of up to 215x215x200 mm and a second fee scan mode using a tripod mount for the scanner with the ability to scan bigger objects up to 700x700x700 mm in size. Shining 3D promises that their device is portable enough for easy carrying around, scanning fast – about 3 minutes for a full automatic turntable scan and easy to be used with automatic processing of the acquired data to provide you with a good 3D model that should be ready to be printed without additional work from the user required. 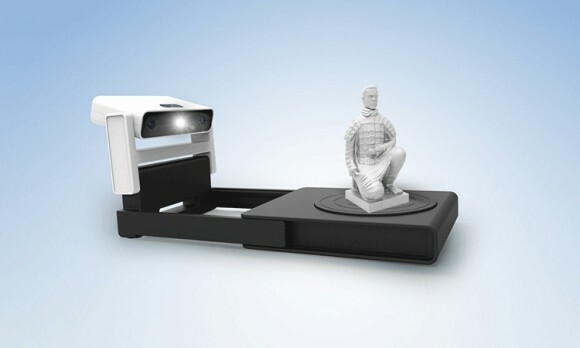 If you are looking for an affordable consumer oriented product for 3D scanning and then printing the resulting models you might want to keep an eye on the EinScan-S desktop 3D scanner among others. The device is quite interesting in terms of specifications and it it really is able to deliver what the manufacturer promises at this price point it is going to be a great addition to your 3D printer. Again we are talking about an affordable consumer oriented 3D scanner with an expected sub $1000 USD price, not about a professional high-end solution that may cost tens of times or even more that price and would be able to offer better resolution. For its expected price the EinScan-S does look very promising, so we are looking forward to seeing the device available on the market and seeing what it can actually do.